Slide Theme Park Peppa down and round this amazing Helter Skelter! Spin round on the Rumble and Roll Ride. Turn Peppa into a ‘carrot’ with the fun character standee or take her on a Spinning Raft Ride! Take into the Hall of Mirrors to see funny reflections…. This toy costs approximately £29.99 (for the latest and best prices make sure you check our retailer list for the PEPPA PIG HELTER SKELTER above). 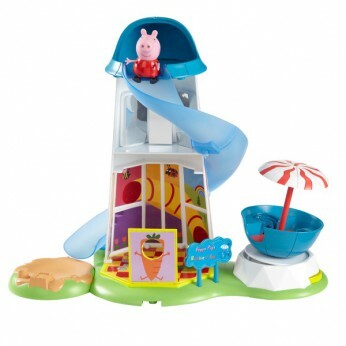 In our review of PEPPA PIG HELTER SKELTER we classed it as being suitable for ages 3 years, 4 years, 5 years but recommend you check the manufacturer specific advice before purchasing.